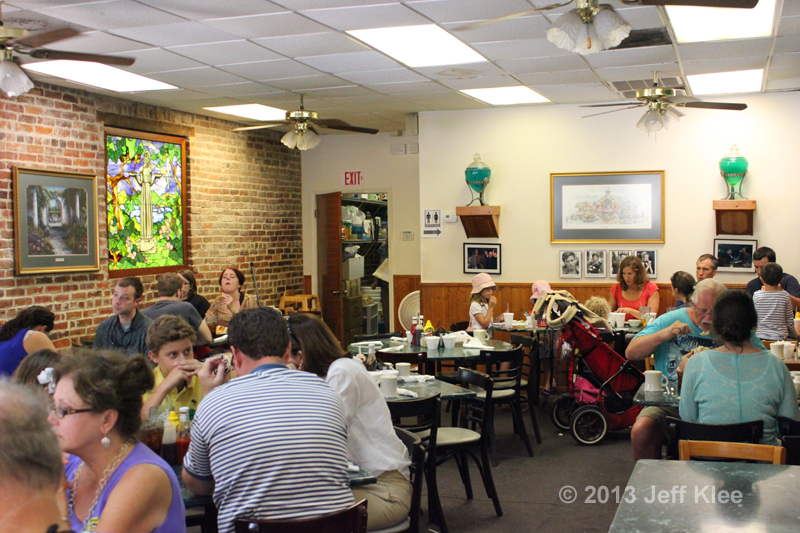 I visited Savannah, GA over the weekend and wanted to sample plenty of food along with the history of the city. Not everything I ate is featured here. I left out the bags of sweets I ate from the two amazing candy shops, River Street Sweets and Savannah Candy Kitchen. 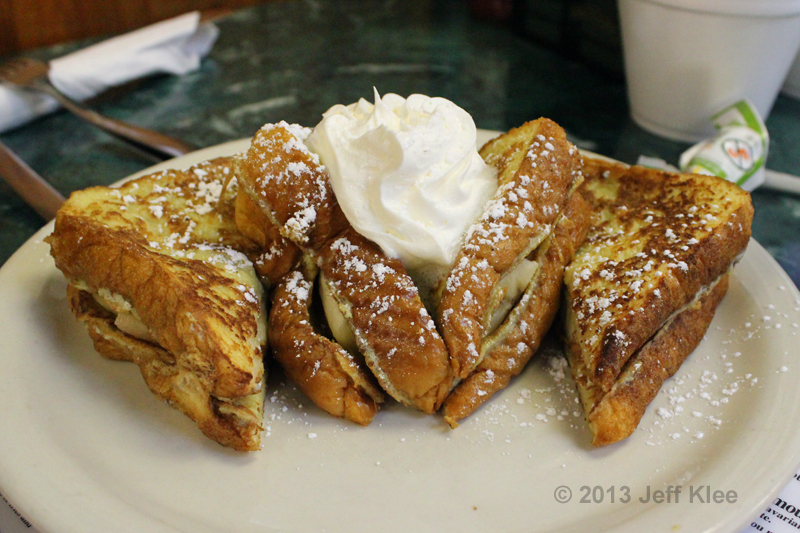 I also left out photos of one breakfast, which I explain later in this report. 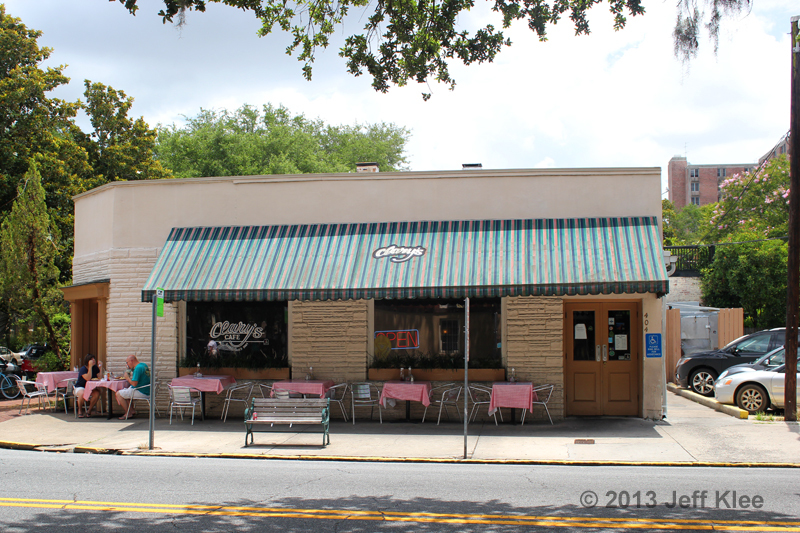 For our first stop, we wanted to start with a breakfast meal, even though we wouldn’t be arriving in Savannah until about 11:00 a.m. Browsing the internet for a good place that serves breakfast all day we found Clary’s Cafe (rated #86 of 403 restaurants in the city on TripAdvisor). There some photos of people’s meals that intrigued me, one of which I planned to order myself. 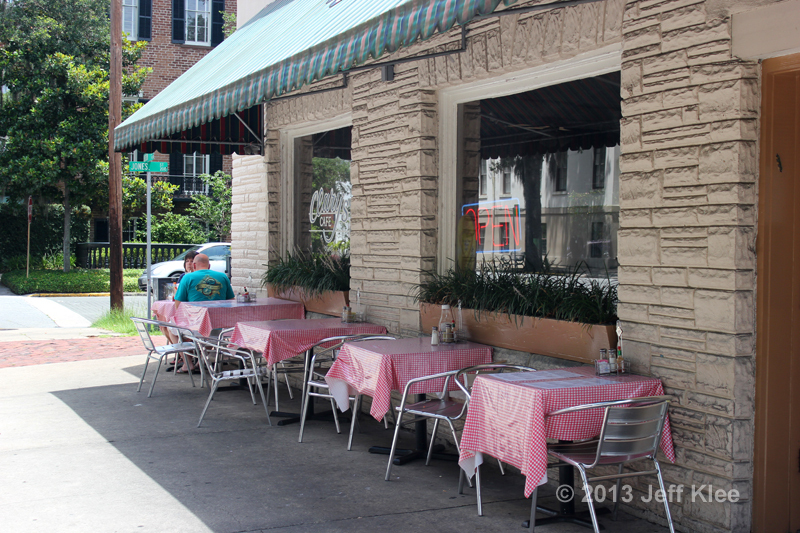 Just out the front door are a few small tables for a meal outside. We are here in late June, and it’s already too hot for me to be eating outside. This lone sign stands at the other side of the driveway to their parking lot. 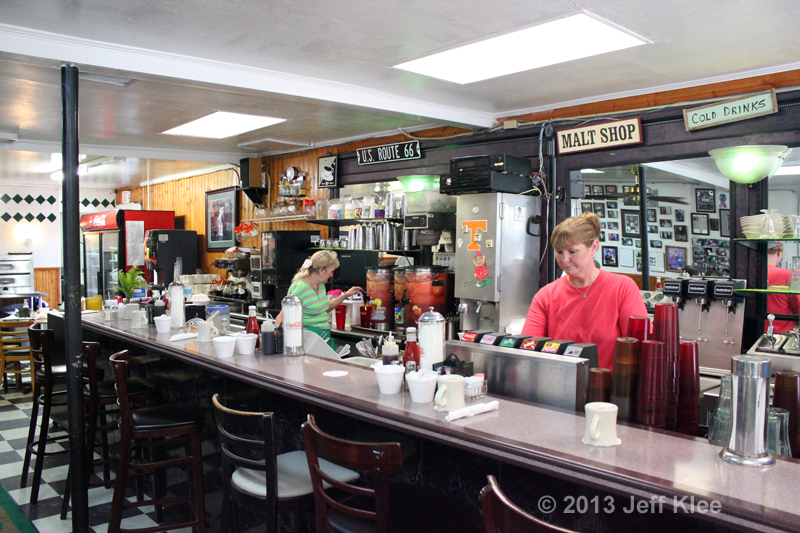 Stepping inside, you see the counter seating, set up like an older style soda shop. Straight back is where you find the kitchen. The left side of the room holds a row of table seating. Taking an immediate left from the last viewpoint brings you to the other side of that wall covered in photos. This side of the room is all table seating. The small cafe was not too busy this Monday afternoon, but I can imagine that on the weekends or other peak times, this building can be packed full. 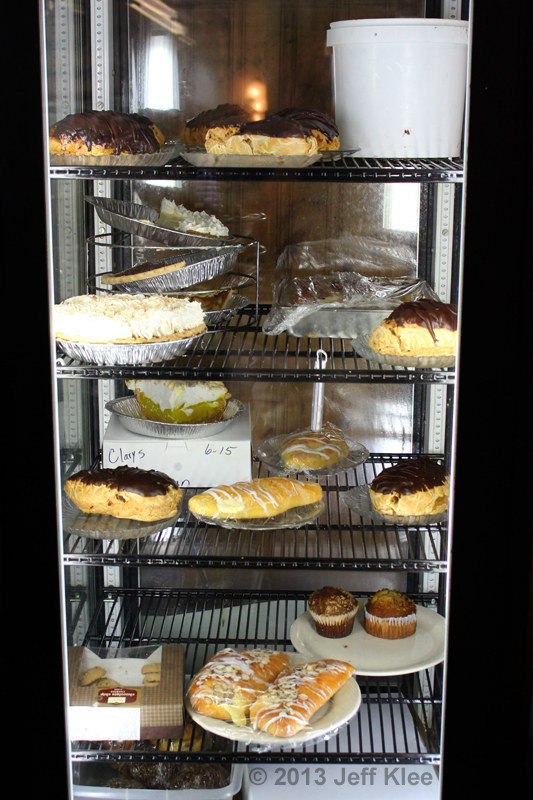 Between the two sides of the room is a dessert case holding some of their creations. 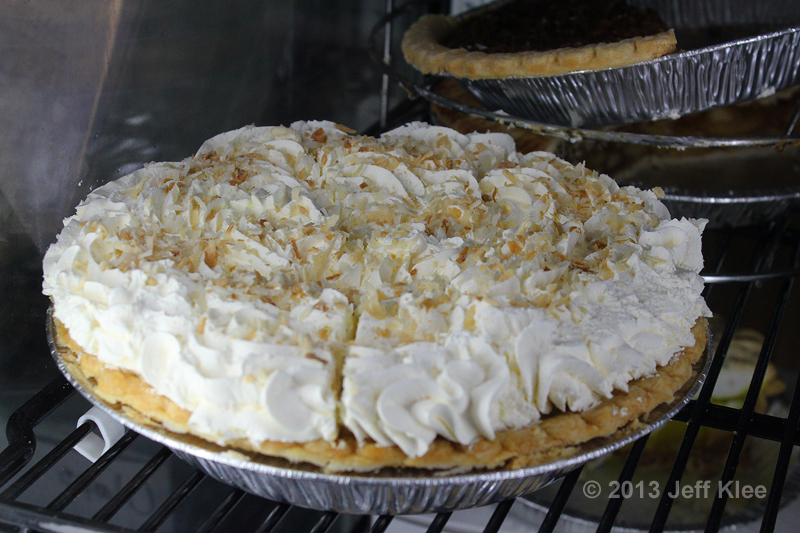 One of the samplings of pies in the case was this coconut cream pie. The case appeared fairly low on supply (it was still early afternoon), and this pie was the only whole pie on display. One unique looking item in the case were these giant football shaped pastries covered in chocolate. I couldn’t figure out what they were. Do you have a guess? I asked one of the servers. It was an eclair! 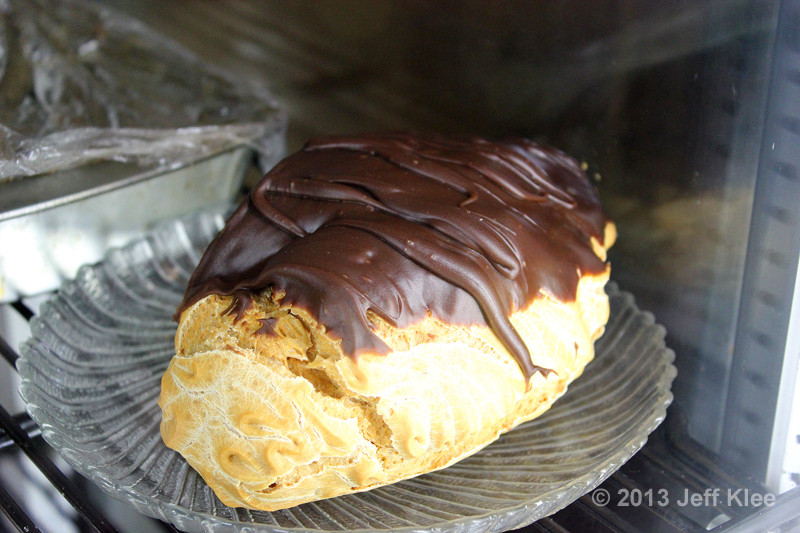 This was by far the biggest eclair I have ever seen, and at $6.99 it was one heck of a bargain as well. Considering the eclair I got at Highland Bakery last week was $3.59, and this was at my best guess equivalent to between six or eight normal sized eclairs, it should have cost between $21 and $29. Showing you the full case again, notice how the eclairs are pretty close to the size of about 1/2 of that coconut cream pie. An additional comparison, those muffins on the shelf below were fairly large themselves. I was just in awe of the size. 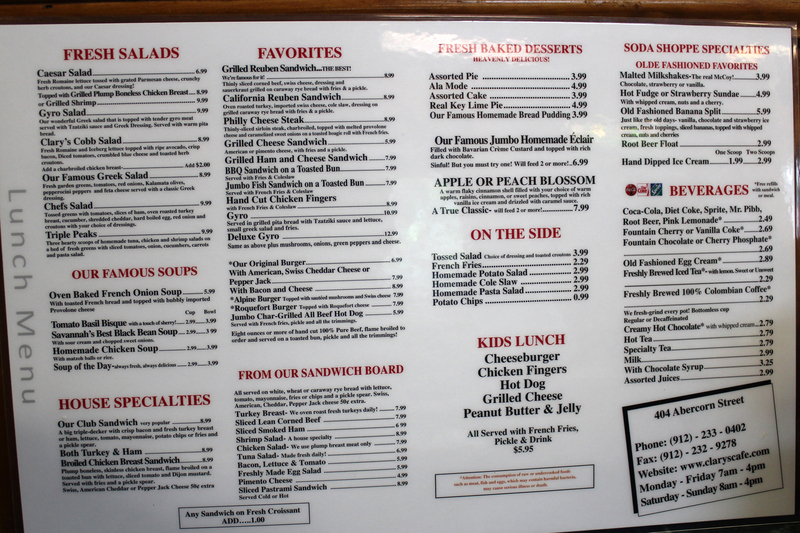 Just like our recent visit to Radial Cafe, the two-sided menu has one side reserved for breakfast and the other for lunch. 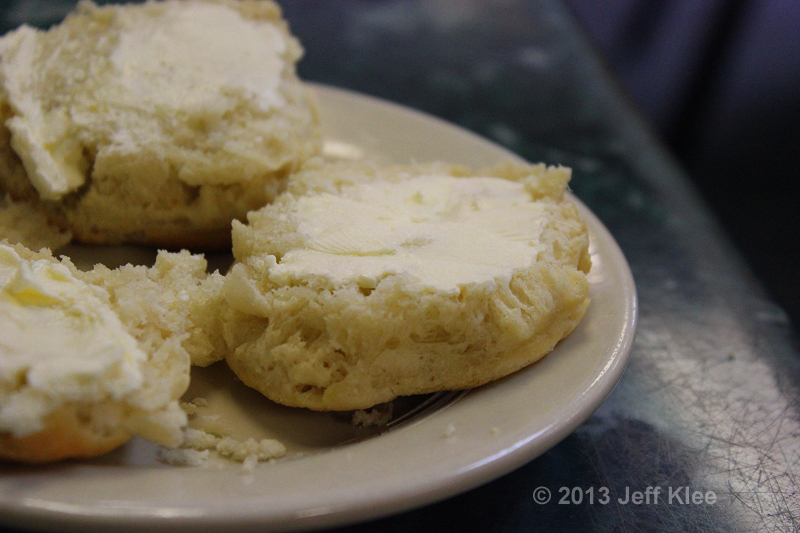 My wife decided she would allow herself a little cheat and we split a side of Two Buttermilk Biscuits for $1.99. These were the typical biscuits that you expect from a Southern restaurant, although they were a little small and not as buttery tasting as I prefer. Overall they were average. 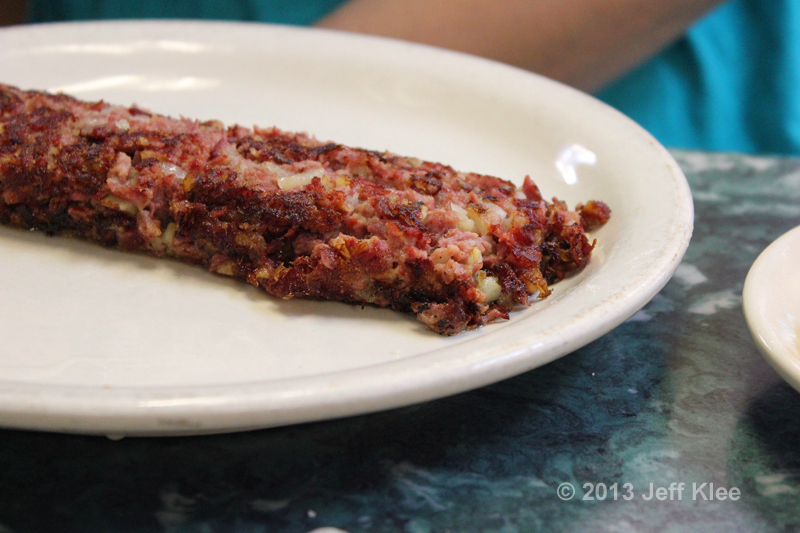 My wife ordered a side of Freshly Made Corned Beef Hash ($5.99). Their menu claims they are famous for this hash. As claimed, they cook an entire corned beef brisket that is used to make the hash. No canned meat here. 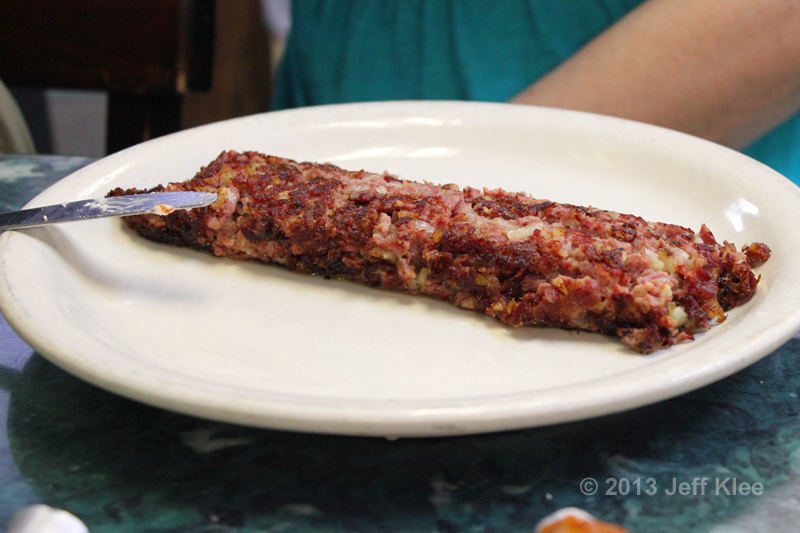 My wife said that unlike other hash she’s had before, this one had a lot of meat comparatively. It was well flavored with the fat from the brisket and the added seasoning. As opposed to other restaurants that typically use a lot of filler like extra potatoes, this hash had much more meat than potatoes. It had just the right amount of onions and overall was very well seasoned. She was very satisfied and would order it again. She also ordered her third item from the Side Orders. 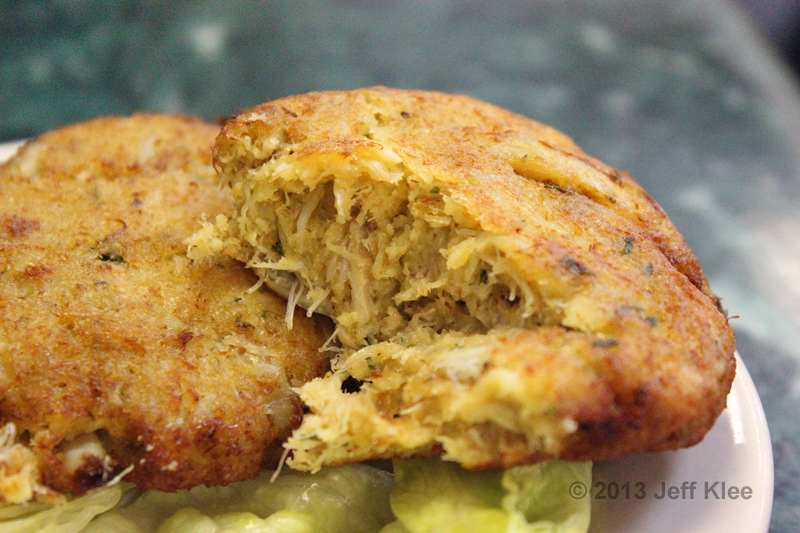 Our Homemade Crab Cakes. 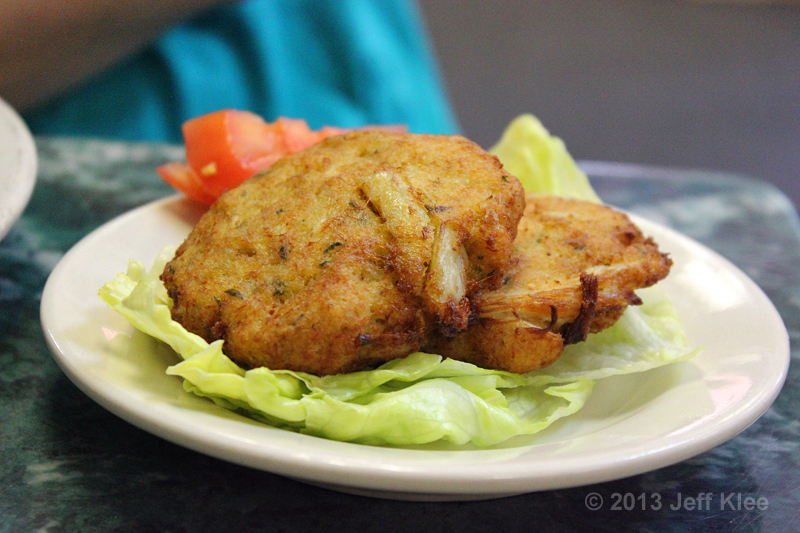 I personally thought they looked really good for a crab cake ordered in a cafe. My wife says they were surprisingly tasty as well, especially considering where we got them. This $8.99 side item seemed a little pricy, but we quickly found some justification. They included much more crab meat than they did breading. Neither of us could tell if the crab meat was real or fake. Considering we assumed that it was fake crab meat due to this being a cafe, it’s definitely a positive that it was good enough to make us unsure. While they did surprise us in taste, they still weren’t amazing. My wife felt they would have been much improved by an included sauce, such as a rémoulade. I tried enough to give it a rating. 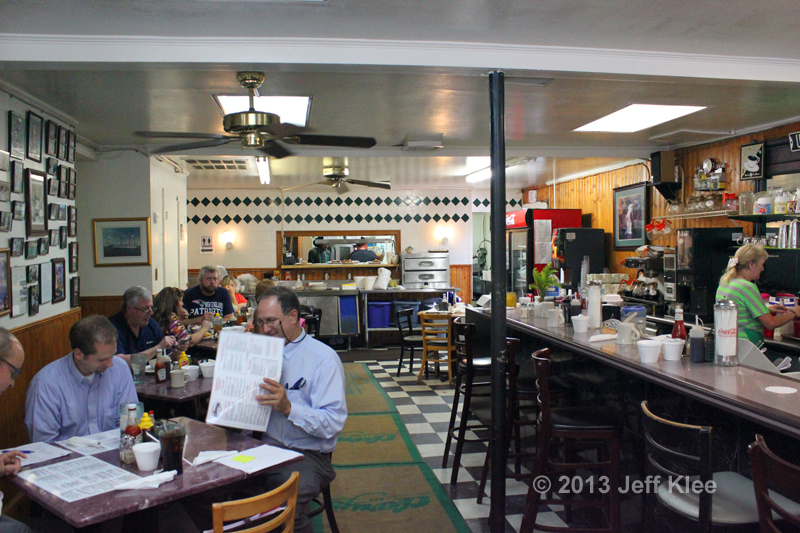 My first entrée was the Hoppel Poppel for $9.99. 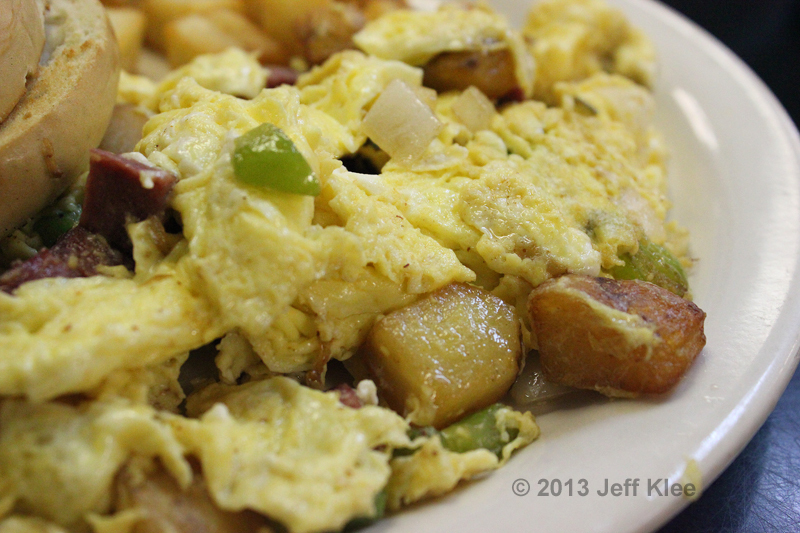 The plate comes with scrambled eggs mixed with chunks of salami, onion, and green peppers. 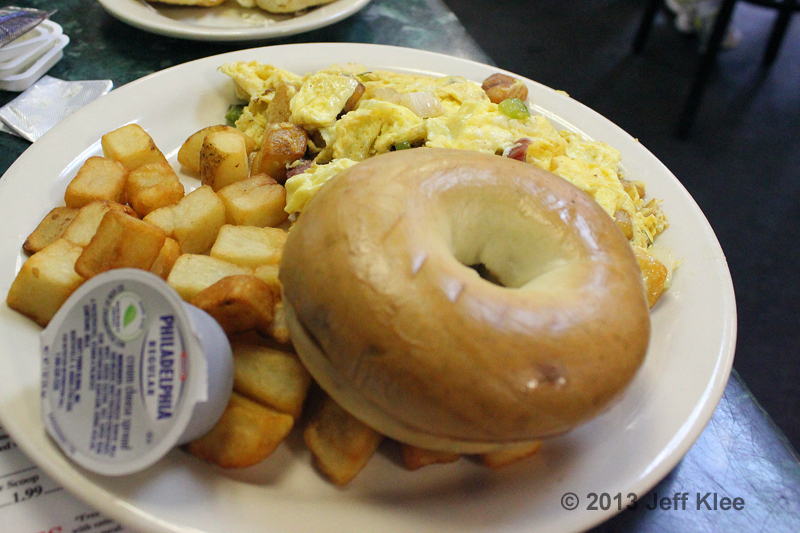 It includes fried potato chunks and a bagel with cream cheese. The eggs did not stand out as anything special by themselves, but what they lacked in seasoning was made up for with the additional ingredients. This is another case where I was happy with the flavor of green peppers in my food. The onion was not strong, but noticeable enough to really improve the taste. The salami added just the perfect tweak in salt needed to keep this meal from being too bland. The potatoes were pretty standard. Simply little squared french fries, they went perfectly with a hearty pour of ketchup. They were evenly cooked to a crisp, and tasted just like the thick-cut fries you’d enjoy at any non-fast food restaurant. 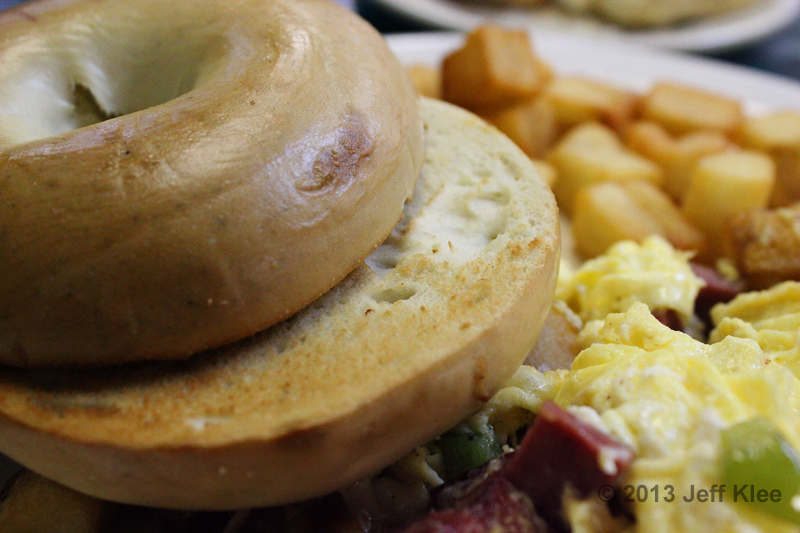 The bagel was your run of the mill store bought product. I’m guessing they just purchase the bagels, take one out of the bag, toast it and serve it up with a small cup of cream cheese. Entrée two was what I really wanted to come here for; The Elvis. 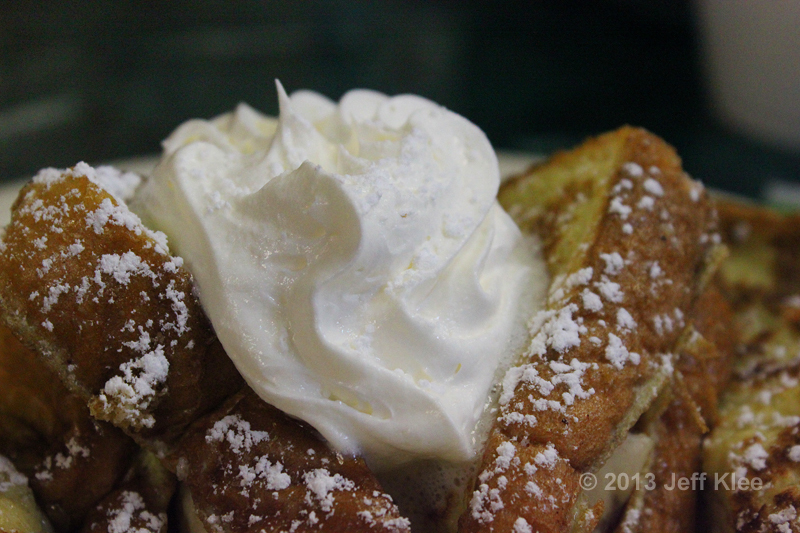 French toast with peanut butter and banana, sprinkled with powdered sugar and topped with whipped cream. Let’s start with that whipped cream. I was almost tricked by the swirls within, as if it came from a pressurized can with the ridged cap that creates the familiar ripples in the cream. I was happy it was real whipped cream, but then my wife said to try it again. This time I slowed down and really tasted it. Darn it! Cool Whip (Or another oil-based equivalent)… I can let that pass, it’s just a small portion of this plate. I wouldn’t call these thick sliced pieces of bread, but that didn’t mean there wasn’t a lot of food. There were four (we’ll call them above average sized) sliced pieces of bread, each cut in half diagonally. In between each triangle pair was a halved banana slice, and dollops of real peanut butter. They didn’t use peanut butter flavor, or a peanut butter cream. This was real peanut butter, straight from the jar. This one portion I opened up to photograph was a poor example, as other pieces of toast had quite a bit more peanut butter. I loved this breakfast. 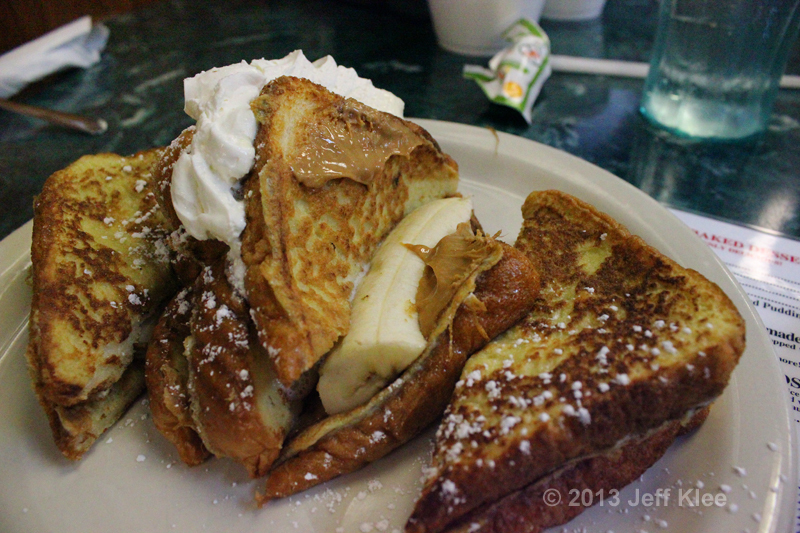 I have had many peanut butter and honey sandwiches in my life, and peanut butter plus syrup is the same concept. 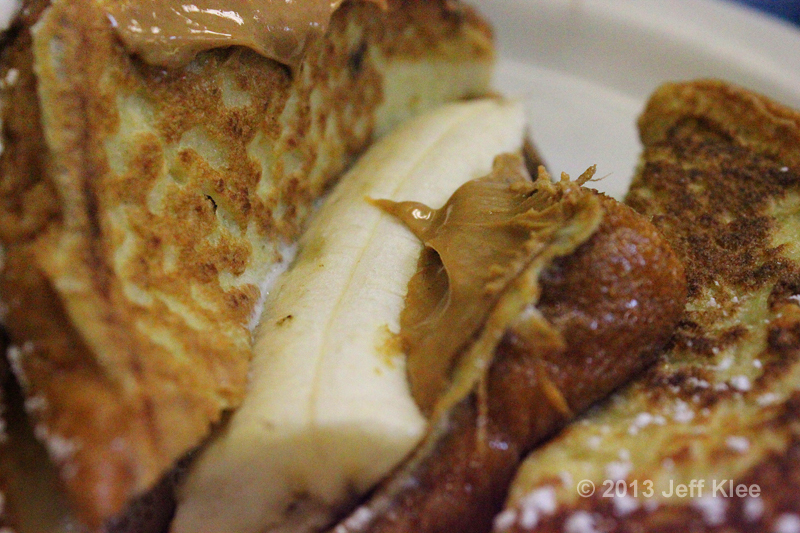 The banana and peanut butter combo is also an American favorite. Put all three together and you have a winner. This was a simply made meal with simple products. There’s nothing exotic or gourmet here, but what you end up with is a cheap meal with everyday products found at home that when combined, offer a fantastic taste. I found great value in this $7.99 breakfast. When it came time for dessert I debated for a while. Those eclairs shocked me when I found out what they were, and they fit perfectly with my hefty appetite. 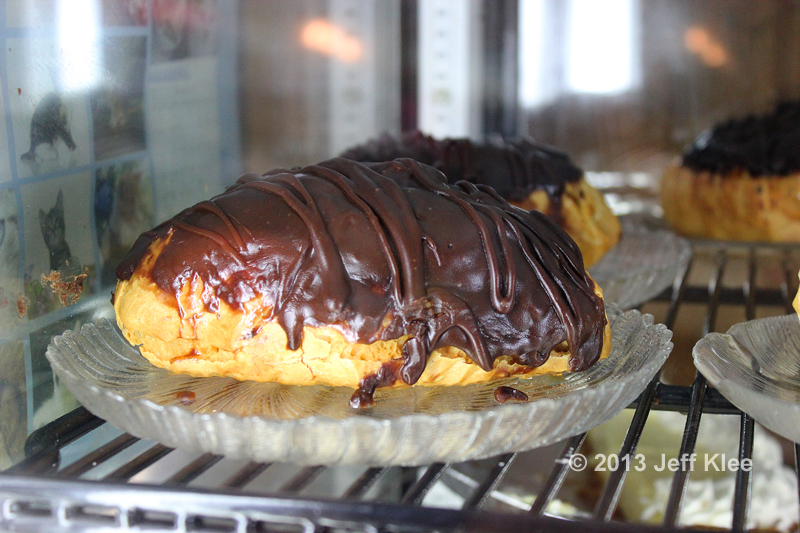 What worried me was the eclair I had recently at Highland Bakery that didn’t impress me. I wouldn’t be happy if I purchased six to eight of those and didn’t love them. I had no idea whether I would like the cream filling in these. It wasn’t worth the risk, especially with a huge dinner only five and a half hours away. 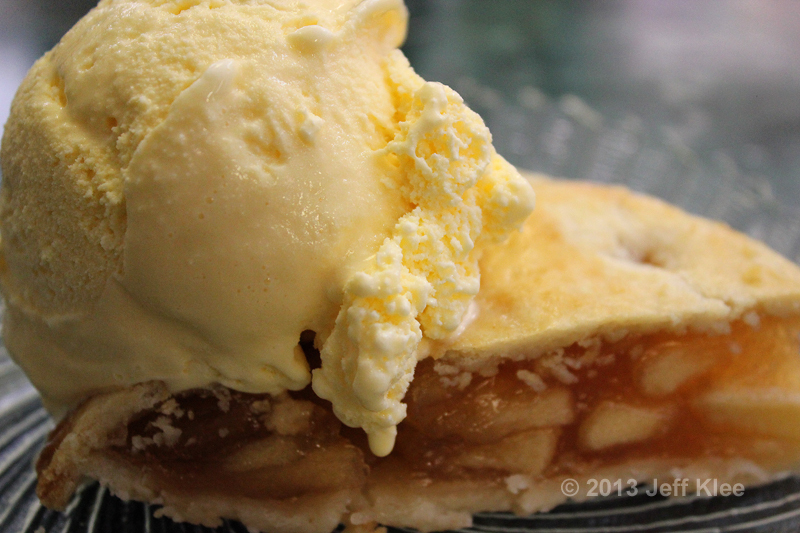 I finally decided on a slice of apple pie. I went for the $1 up-charge and paid the $4.99 for à la mode. Truthfully, the pie was a bit of a bore. Regardless of what may be advertised, the pie was most certainly store bought. If it wasn’t, it was at least “assembled” fresh from multiple store bought products. It came with a generous scoop of an unknown flavored ice cream. The ice cream had a vanilla color, however we noticed streaks of a brown colored ingredient within the scoop that looked to be caramel (my guess) or cinnamon (my wife’s guess). I asked the server what flavor the ice cream was, and she responded “I have no idea. I just scooped it from the container we bought at the store.” No joke, she actually didn’t know what flavor it was, and told me that they just buy ice cream at the store and scoop the unknown flavors onto the desserts. Very disconcerting. 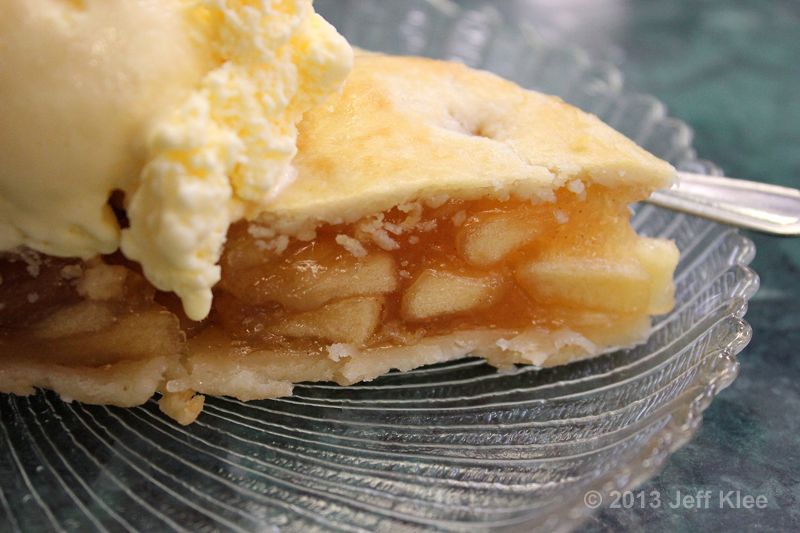 The crust was very soft, not at all flaky like a good butter pie crust that I had hoped this would be. The filling was obviously from a can. It was smooth, almost solid texture with no unevenness other than the apples. Basically there were no flaws that would be evidence of something made from scratch. 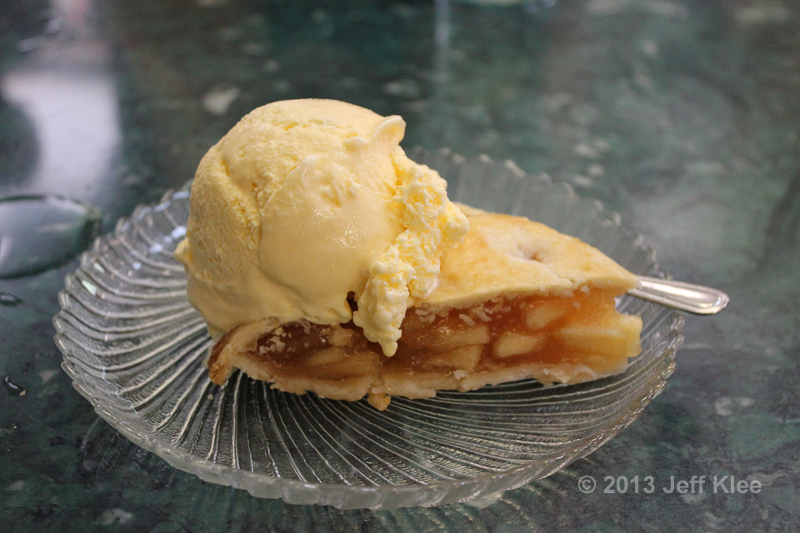 The ice cream was decent, and the pie as a whole was barely average. It wasn’t even heated properly. The outside was warm, the inside slightly above cool. I was disappointed in the dessert since I have been craving a real homemade pie over the last few months. 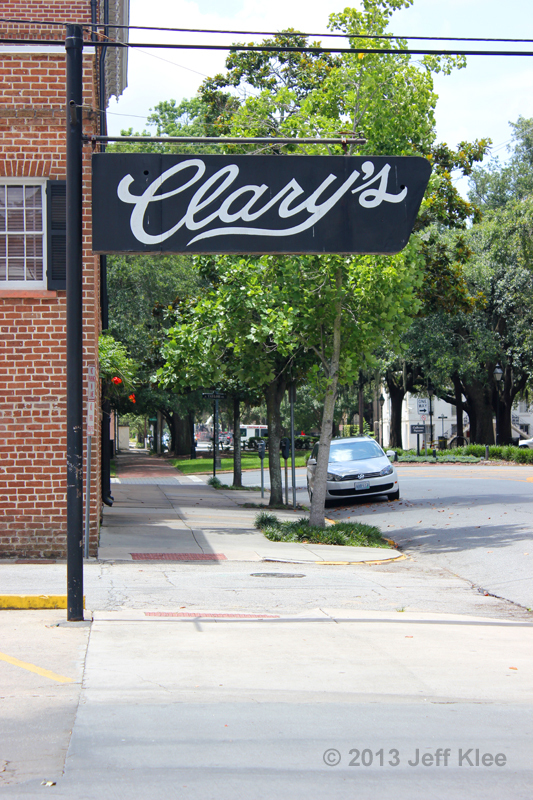 I was not too thrilled with Clary’s Cafe. I had high hopes for The Elvis, and it was close to what I had expected. Everything else was average or below in taste and quality. I’m not too surprised as it WAS a cafe, but with some of the unique items on the menu, I thought they may have something special there. 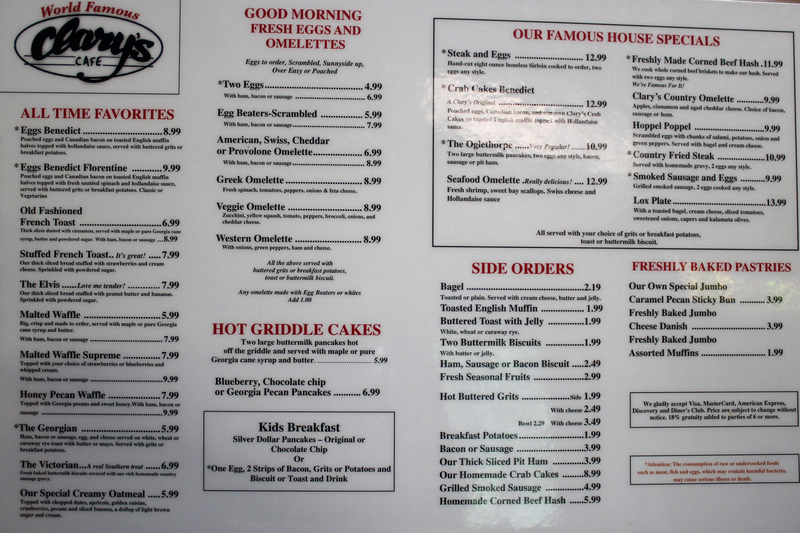 However I would probably still go there again as nothing was terrible and I did really enjoy my Elvis, plus there are a couple other items I really want to try sometime (Malted Waffle). 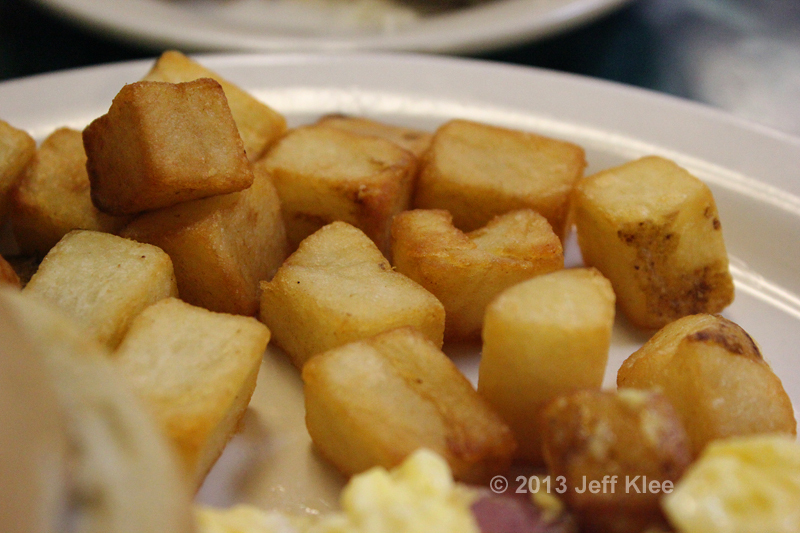 My wife really enjoyed her hash, but agreed that as a whole, there was nothing too special about Clary’s. I’d still recommend it. It has a few high points worth trying. You just have to choose wisely. Someone let me know whether those eclairs are worth trying.